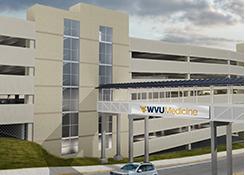 We are building a new 810 car garage for WVU Medicine at the J.W. Memorial Hospital. Precast garages can be built to accommodate compressed schedules while maintaining both high quality and structural durability. The sitework preparation and superstructure manufacturing progress simultaneously, reducing schedule time and weather dependency. Steel frame structures offer design-layout versatility for atypical lot configurations and are ideal for mixed-used applications. Cast in place garages offer long term durability and are best suited for applications where schedule and cost are not primary concerns. CWC can design additional spaces on top of or next to existing facilities. with a variety of structural types with minimal interruption to existing facilities.